This year’s edition provides risk professionals with the guidelines to set up a solid Merchant Monitoring Framework in compliance with EDD requirements as imposed by legal authorities and the card associations. The previous three editions of this series focused on KYC/CDD procedures, explored specific fraud scenarios such as Transaction Laundering and zoomed in on (hidden) high-risk business types. 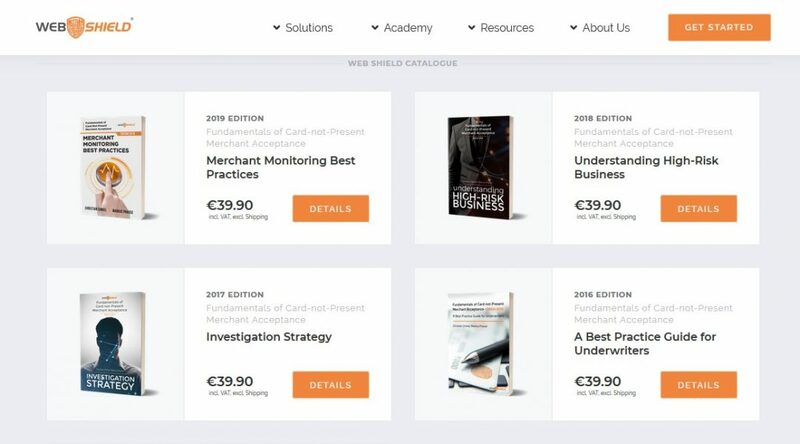 ‘Fundamentals of Merchant Monitoring edition 2019’ explores the seven fundamental monitoring areas, their associated risk indicators and recommended alerts configuration. Depending on the merchant’s risk profile and on the priority of the alerts, immediate action has to be taken to prevent reputational and financial risk. ‍Transaction Monitoring, Financial Monitoring and AML Monitoring are the cornerstones on which Reputation Monitoring, Content Monitoring and Transaction Laundering are built, while Regulatory Monitoring is the cement that holds the blocks together. This robust framework consists of almost thirty monitoring areas which are discussed into great detail. All financial institutions – which includes merchant acquirers – are liable and need to respect business standards to ensure legal compliance at all times. Technology evolves and Machine Learning and Risk Assessment with Neural Networks are promising allies in the battle against Fraud. Detecting fraudulent merchants is key, but what if the merchant is abused by transaction launderers? Once the merchant is approved and accepted the acquirer needs to subject its merchant portfolio to EDD. In the age of Fintech and RegTech, ‘wilful blindness’ is not an option and non-compliance can result in the revocation of the acquirer’s license. ‍All stakeholders in the CNP payment value chain are obliged to guard and protect the financial and reputational integrity of the payments industry. This book aims to contribute to this common goal. The authors of this series are risk experts in merchant acquiring and speakers at international risk and compliance conferences. Therefore I am proud to have collaborated by proofreading and editing the raw drafts of all four books. Each edition focuses on a particular aspect of Merchant Acquiring and explores the necessary steps to be taken in order to prevent and detect emerging Fraud -, Money Laundering – and Transaction Laundering schemes which threaten the stability and profitability of cross-border e-commerce for all stakeholders involved in Payment Processing. All four editions can books can be purchased via Web Shield Ltd.